"I have begun to wonder where I came from. The person I am now,, this fumbling, stumbling supplicant...was I built on the foundations of my old life, or did I rise from the grave a blank slate? How much of is my own creation? Questions that were once just idle musings have begun to feel strangely urgent. Am I firmly rooted to what came before? Or can I choose to deviate?" R is different. R is dead. But what's in a name? That which we call a zombie, by any other name wouldn't sound so bad. If you think about it, R's really not so different from you and me. R feels. Kinda. R speaks. Partially. R eats. Braaaaains. But hey, at least he's conflicted about it. And despite the overpowering yearning to devour people with a pulse, there are definitely remnants of the person he used to be. Sure, he might spend most of his days in an abandoned airport and his friends and family are of the undead variety but the ability to ponder the meaning behind his undead existence is undoubtedly still there. R's capable of doing so much more than we give him credit for---like falling in love. Unfortunately the object of his affection, Julie, happens to be very much alive. Little by little a gradual shift occurs as R transforms into something more than just a corpse. And as R and Julie's relationship blossoms, so does hope and a cure for their largely decayed and undead world. Only one question remains --- what will be the final fate for these star-crossed lovers? Anyone who knows me knows that I love zombies. It's, like, the defining obsession in my life. Don't believe me, check out my About Me page. See! I first heard buzz about Warm Bodies after the release of its awesomesauce trailer. Suffice it to say, I was beyond excited. Little did I know (at the time), the movie was actually an incarnation of a book by the same name. Fantastic! But because I'm a person who is super judgey of on-screen adaptations, I intentially save the novelisations for post theatrical viewing. Check out my movie review of Warm Bodies here. In short, I adored the movie. I figure, if the film version was that good then my expectations for the book had to be validated. And ya know what? I wasn't at all disappointed. It's hard to talk about the book without mentioning my movie experience because though they are the same basic story, the overall tone to each are very different. Warm Bodies (the movie) is light-hearted and quirky --- geared mainly for a YA audience. Warm Bodies (the book), however, is far darker in tone. I'd say it's got less of the Y and more of the A, if you know what I mean. I just don't want those of you who saw the movie to be at all surprised by the book. I won't go into specific detail about the differences because, for all intensive purposes, those differences are what make each version so wonderful. So let's just settle with the fact that both book and movie are equally rewarding and you should indulge devouring in both. Settled? Good. Now back to my review. 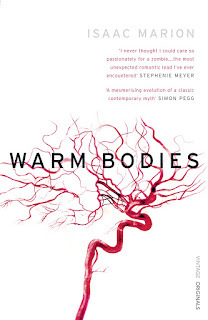 Warm Bodies is a thought-provoking, introspective sort of novel. The action starts at a simmer and builds upon itself in this slow, meandering boil. Unlike the movie, it takes awhile to get things going but it's well worth the wait because, by the end, we're left ruminating in some really beautiful revelations. I fell in love with R and the deep, personal journey on which he takes us. He's not just some mindless zombie, bound by his baser instincts. He's someone who is lost, someone who is trying very hard to find meaning in this life and looking for a place to call home. I mean, isn't that something that most of us struggle with at one time or another? Marion uses R to make keen observations on life, love and what it means to be human. 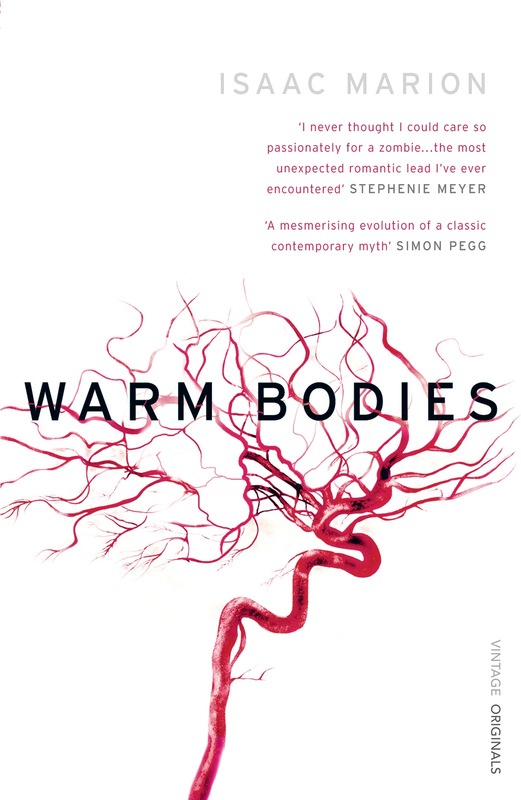 And though I enjoyed Julie as a character, this book is really all about R.
A lot of people say Warm Bodies is the zombie book that's not really a zombie book and ya know what? They're right. Warm Bodies deviates away from many of the stereotypical zombie cliches that plague the genre. For instance, I loved how when R eats a certain BF's brains, he relives key moments in his life. I found that to be a particularly clever departure. This is a book that's about more than just some hideous monsters. It's about growth and self discovery and finding love and beauty in something that otherwise seems devoid of life. Marion is careful and clever with his poignant prose and he uses his words to capture your attention... and heart. I could probably go on forever about how much I adored this book, but I won't. I'll let the prose speak for itself. Warm Bodies is a beautiful debut by Isaac Marion. Though darker than its movie incarnate, it's both touching and insightful without being too heavy handed or preachy. This is a well-written novel that will devour your brain and your heart, even for those of you who aren't into the walking dead. Both the film and the book sound good. Glad the author stays away from the zombie cliches, since the undead are so popular lately. The author actually had a bit of a tantrum about people classifying this as YA, because he insists it's not. I think it's definitely marketed as YA, so it's interesting that you found it to be more adult. I loved the movie too so I should check out the book. Wow, I never knew that, Belle. I can definitely see some darker tones to R's inner narrative in the book which is why I felt that way, however, I can see merits as to why it's classified as YA too. I'd definitely say the movie skews more YA than does the book. If you loved the movie, I think you can really enjoy the book so long as you're aware of the differences. I've got a copy of this and I'm trying to get to it for one of my reading challenges too. So glad you loved it! I also loved the movie, and I'm always curious to compare books and movies, so I can't wait to read it. Oh yes! You should totally read this one because it's sooooo good! If you enjoyed the movie then I have no doubt you'll like the book (so long as you understand that they are different). It's fun to make the comparisons so long as one doesn't ruin the other for you.